Trilobites rank among the most important of early animals. Our knowledge of them has been gained from the study of their fossils, usually impressions left of their shells after burial in sediment which subsequently hardened into rock. They appeared abruptly in the early part of the Cambrian Period, and came to dominate the Cambrian and early Ordovician seas. A prolonged decline then set in before they finally became extinct in the Permian Period, about 250 million years ago. Trilobites were arthropods — like many invertebrate animals living today, including crustaceans, spiders and insects. Geologists know that they were marine animals because of the rocks in which they are found and the types of fossils associated with them. Specimens of Calymene from the Silurian Period. Calymene was able to roll into a ball for protection. Parts of a trilobite exoskeleton. For support and protection, the soft parts of the trilobite animal were covered by anexoskeleton. Usually only the dorsal part of the exoskeleton, covering the animal's back, is fossilised. The ventral part of the animal, its underside, may have been covered by a soft membrane or material that could not be fossilised. Trilobites are divided into three parts from head to tail (head, thorax and tail) and from side-to-side (the central axis and two lateral lobes). The word 'trilobite' (three lobes) refers to the side-to-side partition, not the division into head, thorax and tail. Trilobites belonged to the phylum Arthropodalike crustaceans, spiders and insects. They aredivided into three parts from head to tail (head, thorax and tail) and from side-to-side (the central axis and two lateral lobes). The word 'trilobite' refers to the side-to-side partition, not the head, thorax and tail. The exoskeleton is divided from side-to-side into a central axis, with two side regions (or lobes) termed pleurae. It is separated from anterior to posterior into a head-shield (termed the cephalon), a thorax, and a tail-shield (the pygidium). The cephalon, thorax and pygidium are all divided into segments. The segments of the cephalon and pygidium were fused, but those of the thorax were not, enabling the animal to roll into a ball to protect its relatively exposed ventral side in times of danger, like the specimens of Calymene shown above. The central region of the cephalon is termed the glabella. The cheeks on either side of the glabella are usually separated from the rest of the cephalon by a facial suture into fixed cheeks (adjoining the glabella) and free cheeks on the outer edge of the cephalon. The suture helped the animal to moult during growth. When moulting, the trilobites' cast-off exoskeleton often fell to pieces so that their fossilised remains are usually found as fragments. Lifestyles of trilobites: the painting shows how trilobites from different periods lived in the sea. In shallow waters amongst the bivalves (1), crinoids (2), algae (3) and gastropods (4), the faunas were large, but of low diversity, e.g. Flexicalymene (5). Intermediate faunas were more diverse Selenopeltis (6), Geragnostus (7), Chasmops (8) and Remopleurides (9) lived alongside brachiopods (10) and nautiloids (11). In the depths of the sea, the trilobites were small and blind with moderate diversity Ampyx (12), Tretaspis (13) and Shumardia (14), with Pricyclopyge (15) swimming above. Pricyclopyge, a trilobite with large eyes and all round vision which probably swam rather than crawled on the sea floor. (x2.5). Trinucleus, a trilobite with no eyes, which lived in mud or at great depths. It had spines for support, and a fringe with pits, possibly for sensory organs. (x3). Most trilobites had eyes, although blind forms are known. The eyes are situated on the inner edge of the free cheek, adjacent to the fixed cheek. Trilobites had compound eyes, consisting of a number of separate lenses. The number of lenses and the complexity of the eye structure varied enormously. Some trilobites had large, convex compound eyes (like a fly's) with a large number of lenses, giving them a wide field of view forwards, backwards, sideways, upwards or even downwards, depending on the actual curvature of the eye. Other trilobites had much smaller eyes, with fewer lenses, giving them a more restricted view. Many trilobite eyes consisted simply of closely packed prisms of calcite, but in some later forms, for example the Silurian-Devonian genus Phacops, the eyes had more complex lenses. Using these, Phacops may have been able to see an object clearly, and even estimate how far away it was. Other sensory organs include pits, canals, tubercles and spines on the surface of the exoskeleton. Soft parts are known for a few trilobite species, preserved under special circumstances in Lagerstätten. From these, geologists know that trilobites had a pair of jointed antennae protruding forwards from beneath the cephalon, and rows of jointed limbs on each side of the body. Trilobites had three pairs of limbs beneath the cephalon, and a single pair of limbs beneath each segment of the thorax and pygidium. Each limb had two branches, a lower branch used for walking, and an upper branch bearing a large number of fine filaments which may have been used for breathing. Paradoxides: one of the giants of the trilobite world. This specimen, though incomplete, is 12 centimetres long. In contrast this tiny agnostid trilobite is five millimetres long. Some have questioned whether agnostids are really trilobites at all. The great variety of body shapes and sizes indicate that trilobites occupied a variety of ecological niches. Blind trilobites may have burrowed and scavenged in mud on the sea-floor, or lived at great depth in the sea where there was no light. Other trilobites are associated with trails on bedding planes (e.g. Cruziana) which show that they moved about on the sea-floor, perhaps scavenging or preying on other animals. These trilobites were part of the benthos. Yet more trilobites, such as Cyclopyge, had large eyes that enabled them to see downwards as well as in other directions. This, together with their widespread distribution, has led geologists to think that they swam or floated above the sea-floor. Many trilobites were 3–6 centimetres long, but some such as Paradoxides were giants, up to 60 centimetres or more, while others like the tiny, blind agnostid trilobites were no more than a few millimetres long. The reign of the trilobites: they appeared in the Cambrian Period and became extinct in the Permian. In Britain, trilobites occur in rocks of Cambrian, Ordovician and Silurian age, for example in Wales and the Welsh Borderland, in Devonian rocks of south-west England, and in Carboniferous rocks, for example in Lancashire. Geologists use trilobites in a variety of ways to help them understand how the Earth has developed. One use is in the relative dating and stratigraphical correlation of sedimentary rock successions, especially in rocks of Cambrian and early Ordovician age. Trilobites are particularly important for correlating Cambrian rocks. Paradoxides, for example, occurs in rocks in England, Wales, Newfoundland, Sweden, Spain and Siberia, and shows that these rocks are all of the same, Middle Cambrian age. Other stratigraphically useful trilobites include species of Merlinia in the lower Ordovician and Calymene in the Silurian. There is some evidence that particular trilobites lived at a certain depth in the sea, and so can be used as indicators of environment. Neseuretus is an example of a genus that is associated with very shallow water deposits, whereas trinucleid trilobites, such as Whittardolithus, are thought to have lived on a deep sea bottom. Another use of trilobites in geology is in reconstructing past geographies (palaeogeographies) and past environments (palaeoenvironments). 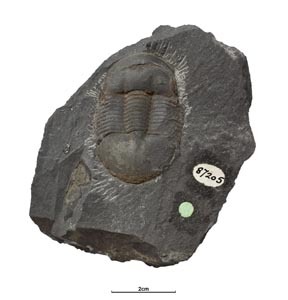 The early Ordovician trilobite Petigurus is found in north-west Scotland but nowhere else in Britain, although it can be found in North America. Early Ordovician trilobites from England and Wales (e.g. Placoparia) are unlike those from North America, but are also found in France, Spain, Portugal, Bohemia and North Africa. This is part of the evidence showing that much of Scotland was close to North America about 500 million years ago, and was separated from southern Britain by an ocean called Iapetus. A continental reconstruction around 500 million years ago using today's geographical outlines. The Iapetus Ocean, which separates the trilobite provinces, closed in the Silurian and the resulting collision between North America and Europe produced the Caledonian mountains. The Pahvant Ute Indians of Utah wore specimens of the Middle Cambrian trilobite Elrathia kingii around their necks as a lucky charm. Trilobites have long attracted popular as well as scientific attention. The Pahvant Ute Indians of Utah wore specimens of the Middle Cambrian trilobite Elrathia kingii around their necks as a lucky charm. One indian is reported to have said, in the early 1900's, that they were used as a charm against sickness and being shot. He added, perhaps ironically, that as far as being shot was concerned, 'at least it work for a time'. There is a story of a group of indians who, having stolen some horses from white immigrants in the late 1800's, went to collect trilobites as protection against the expected reprisals. Coat of Arms granted to Dudley Corporation in 1957. Closer to home, well-preserved specimens of Calymene blumenbachii are so common in the Wenlock Limestone of Dudley, in the West Midlands, quarried for lime in the late 18th and 19th centuries, that they became known as the Dudley Locust (also known as the Dudley Bug or Dudley Insect). Calymene is even featured at the centre of Dudley's Coat of Arms. ...the magician even has a trilobite from this area named after him — Merlinia. Elsewhere, there are associations between trilobite tails and butterflies or bats, for example in the Swedish fjärilssten and the Chinese Hu-die-shih, both meaning butterfly stone, and the Chinese Bien-fu-shih, meaning bat stone.